European Union calls on Israel to halt demolition of illegal Palestinian construction funded by the EU. The European Union on Saturday called on Israel to halt the demolition of illegal Palestinian buildings, some of which are EU-funded, and reiterated its opposition to building Jewish homes in Judea and Samaria. "In the past weeks there have been a number of developments in Area C of the West Bank, which risk undermining the viability of a future Palestinian state and driving the parties yet further apart," the EU diplomatic service said in a statement. It referred to Israel's decision on January 25 to declare 154 hectares (380 acres) of land near Jericho in Judea as state land, with reported plans to build around 150 new residences. This was followed by the demolition of several illegal, EU-funded structures in the south Hevron hills on Wednesday. "This is particularly concerning both because of the extent of the demolitions and also the number of vulnerable individuals affected, including children who need support," the EU said, adding that "demolitions included EU-funded structures." 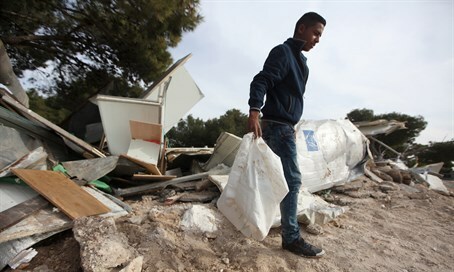 "We call on the Israeli authorities to reverse the decisions taken and to halt further demolitions," it said. Foreign ministers from the 28 EU nations had confirmed "the EU's firm opposition to Israel's settlement policy" and criticized what they referred to as "demolitions, confiscation and forced transfers." The EU has been sharply criticized by Israel for its funding of illegal Arab construction in Judea and Samaria, a policy observers note is clearly meant to create "facts on the ground" in violation of the Oslo Accords.